Ammo crate PCs have been around since Unreal Tournament LAN parties, but this one goes further back than that; [Simon] put an Apple II in an ammo crate. 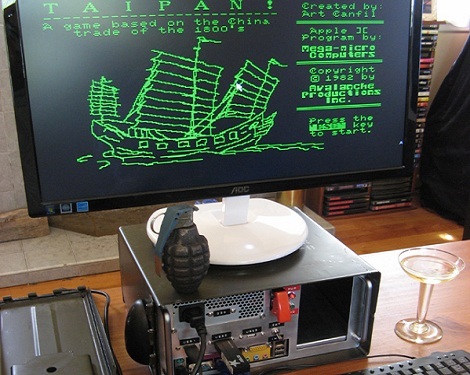 It’s a fitting anachronistic build from the same guy that built the TARDIS MAME cabinet. Thankfully, [Simon] didn’t tear apart an Apple IIc for this build. A bare-bones Celeron motherboard was acquired for this project to run the AppleWin emulator. Instead of shoving all the parts into the box and calling it a day, [Simon] did it right and fabricated a very nice frame for the computer. With a wimpy CPU and no expansion cards, the Ammo Tin ][ can run very cool without drawing a lot of power. We really have to hand it to [Simon] for this build. The metal work on this build looks great (it should for someone who is rebuilding an Austin 7), and we’ve got to respect the love for the Apple II. Now all that’s needed is a real Apple II keyboard on that USB port. Cool build, it gave me an idea for a more practical application of an ammo box: A real ammo box is sealed. Imagine building a PC inside one that can withstand rain, dirt etc when closed, and when opened gives access to ports and cools itself through just one side. Should be possible to pull off with the right layout and a positive-pressure cooling system, and it should boot from an SSD of course so that it will be shockproof. Going by the photos this is sealed box, with a latch typical most of us are used to seeing on army surplus ammo boxes. The genuine item has always been difficult to buy in my area, and shipping by mail order is a killer. Walmart at the begging of hunting season stocks a plastic “dry” box. and has been holding the price ~ $11.00 for several years now. When the budget allows I pick one up, so I have my own private stock. Initially they had the Remington brand on the label, but now have another label. When the budget allows? …For $11? My Grandfather fought in WW2 as a medic and he gave me a lot of his military equipment that he got to keep when I was a kid and he gave me an actual ammo crate (metal one) and a gernade (not working) and some other random things but now I see a good use for that crate! Not only does he have great taste in vintage computer hardware, he also has great taste in vintage Apple II games. Taipan is one of the best on the system. “Thankfully, [Simon] didn’t tear apart an Apple IIc for this build”? Apple IIc’s are a dime a dozen. Or maybe $10/ea. At any rate, they’re not hard to find, and they’re cheap. The IIc is somewhat common, but given the size of the box he could have used a IIgs mobo, which is actually far more common than the IIc. Needs more classic computer emulators on it, BBC Micro, Atari 400/800, TI 99/4A, VIC 20 and of course C-64! http://www.flickr.com/photos/openfly/4461009537/ One I made a while back. Obtendran un blog, buscamos redactores para la web de articulos tecnicos hacking.